Heat the oil in a deep pan and brown the chicken skin side down first for 3 to 4 minutes; turn over and cook on the other side for another 3 to 4 minutes. Transfer to a plate and keep warm. Using the same pan sauté the onions with a little salt for about 5 minutes until they turn a golden colour. Add ground spices and mix them with onion and garlic. Heat will release their aromas. Return the chicken to the pan and coat it with the spice mixture. Add the wine, bring to a quick boil for 1 minute until reduced and then add water and bay leaves. Bring back to boil, reduce the heat, and simmer for 40 minutes. 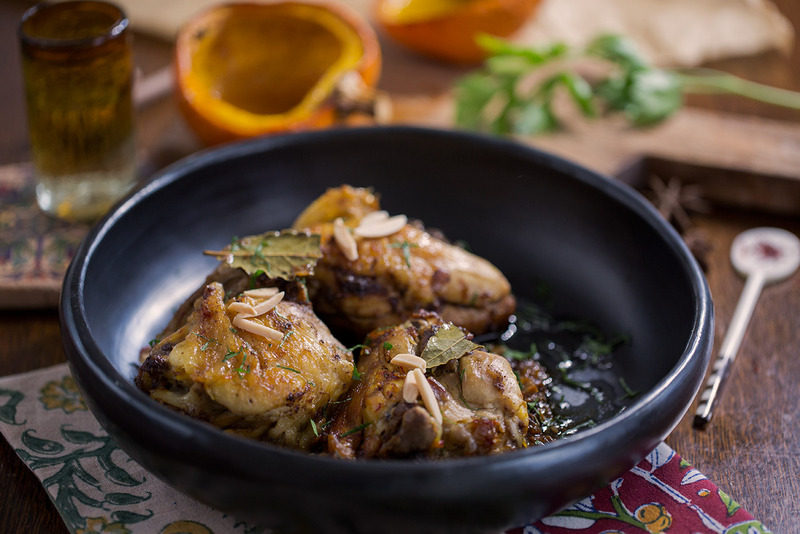 Let the chicken rest for 5 minutes before serving it garnished with parsley and toasted almonds.